Walk into Crafty Planet in Minneapolis, and you’re sure to see bolt after bolt of colorful fabrics lining the walls and crowding the aisles. The rainbow of colors and prints, as well as the varieties of fabric types, can overwhelm the senses, especially for someone who may not be able to distinguish a yard from a fat quarter. When you have crafty friends, however, draping a bolt on a cutting board is easy. 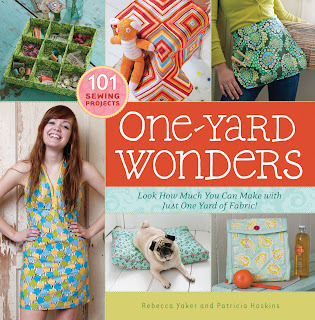 Crafty Planet is owned by Patricia Hoskins, coauthor with Rebecca Yaker of One Yard Wonders. In honor of our celebration of the number-one craft book in America, Storey Publishing held a yard-of-the-month sweepstakes. At random, 25 winners were selected to receive one yard of fabric each month for one full year. Thanks to fabric houses Alexander Henry and Michael Miller, the Storey publicity department was inundated with bolts and pieces of glorious fabric. From yards of “It’s a hoot” to the glamorous pastel “lorenza,” there was lots of work to be done before the first shipment of fabric could be sent out. There was one problem: how to cut all this fabric? Always in the mood to combine work with pleasure, the publicity department threw a pizza and fabric-cutting party — not a job for the weak or messy. Thankfully, the Storey editorial department came to our rescue and gave a lesson in fabric cutting – into yards, specifically. The most important thing to remember is that fabric is measured lengthwise. Once 36 inches of fabric has been measured, the fabric is then cut using a pair of fabric shears. If a piece of remnant fabric is brought to the table, it is always folded in half; then the yard is measured and cut. Get ready, winners, the first yards are ready to be sent out! “OH, MY GOODNESS! Thank you so much! I love One Yard Wonders, and I look forward to the year of fabric! Trust me, it will be put to good use,” winner Christa S. said. I LOVE this book and am "blogging" my way through the projects : ).